Acquisition History: The New Hampshire Fish and Game Department purchased the Mascoma River WMA in 2000 with state Waterfowl Conservation, Habitat Conservation, and Public Access funds. Description: The Mascoma River WMA is comprised of a mix of grass and shrub dominated old fields, alder swales, hedgerows, forested areas of hardwood and pine, and riparian and wetland habitats associated with the Mascoma River and Goose Pond Brook. The property is split by the Mascoma River with almost two miles of frontage along the river. An additional 1-half mile of frontage along Goose Pond Brook forms most of the northern bound of the parcel. 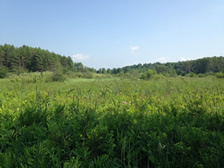 Common Wildlife: The Mascoma River WMA has been a pheasant stocking site for over 25 years. The Mascoma River, a cold water fishery, and Goose Pond Brook are popular with anglers. Common wildlife species include white-tailed deer, black bear, moose, fox, coyote, ruffed grouse, and woodcock. The combination of habitats supports breeding wildlife, migrating waterfowl, and numerous species of songbirds. 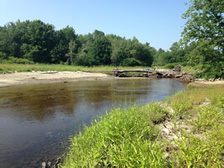 Special Notes: The Mascoma River WMA is the site of an exciting river restoration project being undertaken by the NH Fish and Game Department with design and financial assistance provided by the Natural Resources Conservation Service. An undersized culvert will be removed and the eroding banks of the river restored to re-establish important fish and wildlife habitat. This project is expected to be completed in 2010. Directions: The property can be accessed from Goose Pond Road in Canaan. Visitors can park along the road and access the property by foot along an unimproved dirt road across from Stark Hill Road. Although the Mascoma River bisects it, there is no canoe or boat access on this property. An NHFG owned canoe/car top boat landing is available approximately 0.5 miles south of the WMA where the river crosses Route 4.